In the twelve days that I was in Australia, you’d not believe the amount of food that went into my stomach; I refused to stand on the weighing scale now – I probably gained an additional five kilos, everyday it was food, more food, and even more food. Besides stuffing myself full with everything that I can grab, and enjoying the magnificent scenaries there, I got to talk with a lot of backpackers while staying in hostels, and also met up with the amazing Sydney food bloggers – they are definitely the highlights of my trip. Sydneysiders love Bills, and I love the Sydneysiders for the way they enjoy their breakfast. Bills is a cafe opened by the famous chef Bill Granger, the concept is easy – serve the most gorgeous scrambled eggs and tasty ricotta pancakes in a simple cafe, and voila, you get all the people coming in for breakfast. ‘You have to try the eggs while you are in Australia’, gushed one of my friend a while ago when I told her I’m going to Sydney. 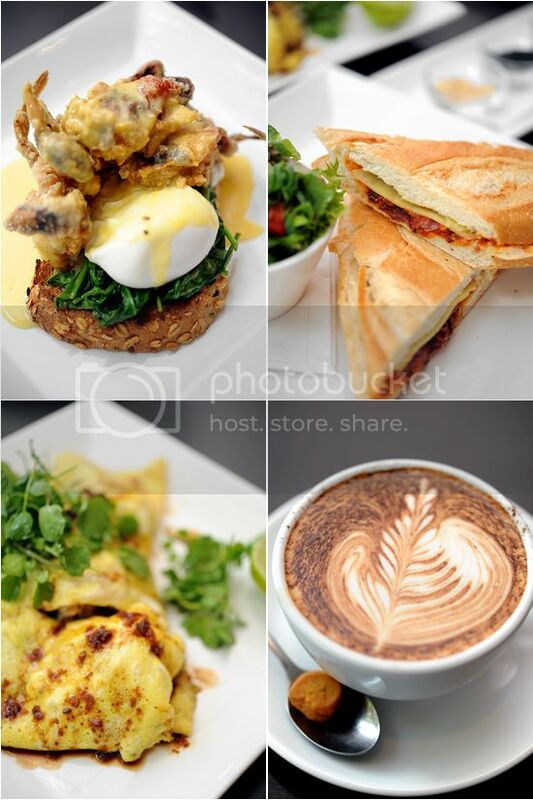 Sydneysiders really love their breakfast, on a normal weekday there’s so many places serving brunch. Because of the differences in culture, you can hardly find much places in Singapore that do that but here, you’d thought that the people do not need to work and it seems like they do not have to work when I saw so many of them slowly enjoying a laid-back & causal breakfast at 10am where most people are supposed to be in the office, working. There was however, no Eggs Benedict at Bills, so I had their popular Scrambled eggs on sour dough ($16) – and it was good! The one sprig of leave in the middle somehow seemed to make the eggs glowed with radiance, and there’s the just-right consistency in the texture and taste of the eggs. The butter slides off the toasted golden-brown sour dough easily, and the scrambled eggs just goes so well with the toast. The portion would probably deceive your mind that you need to order something else as add-ons, but by the time I was done, my stomach was so full that I couldn’t possibly eat anything else, well, maybe except for the delicious-looking ricotta pancakes that everybody is craving about. ‘Come to Sydney for fine restaurants and go to Melbourne to experience the cafe culture.’ I’m not entirely sure on that statement, since there’s dozens of wonderful cafes just in the surry hill/balmain area. One of them is Cafe Nookie at Cleveland street. Technically speaking it is not a cafe since there’s no seats for dining in, customers take away the self-brew coffee from the good hands of owner Ben. Cafe Nookie is more like a coffee-in-the-hole kind of place, and it’s definitely the smallest cafe in Sydney, pretty cool eh? I walk through the streets of Surry Hills and my heart fluttered with a sort of feeling that I couldn’t quite describe – I’m so in love with this place. There’s plenty of trendy fashionable boutiques, and chic cafes just around every corner. The whole place is so quaint and dainty that it doesn’t seem to be in the city area. Cafe Ish is exactly like how I will like a cafe to be, white walls with sunlight coming through the windows, serving nice coffee and comfort food. Howard & Teresa brought me here for lunch, and we took some time glancing through the menu before deciding to order Eggs Benedict, Emu damper, & Soft shell crab omelette. I think the reason why we can embrace cafes freely rather than fine dining restaurants is because deep down inside everyone of us, most people have a dream to open a cafe, someday. A small-ish, causal chic cafe which serves comfort food, a place where people return and chill out all day, a place almost like their own home. It is not difficult to see why Cafe Giulia is immensely popular with the locals, they serve a wide array of food that includes eggs, salad, pasta, sandwich, burgers; comfort food with a reasonable price range. Coffee is another hallmark of a good cafe. Here, they keep it simple to mocha, and ice coffee, with an impressive selection of fresh fruit juices. 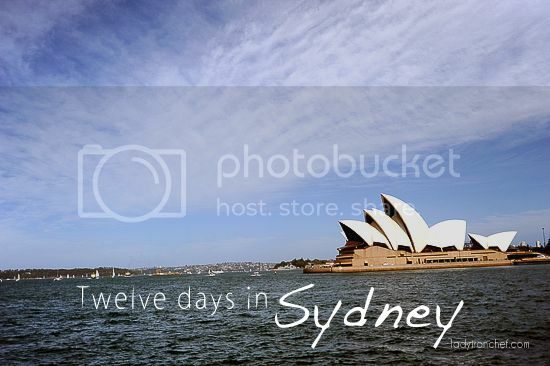 This is the first part of my Twelve days in Sydney series, to be continued . . .
Eh why you get to take photos in Bills? I thought they have a no photog rule? Or is it bec you can make their food look so good that more people will go crowd into the already super crowed bills? Can’t wait for your perspective with the other posts! The barista did an amazing job! I have decided to read your blog only during breakfast, lunch and dinner because any other time would be a BAD idea. Okay, that’s it. I so need to book plane tickets to Sydney next year, pronto! I like the international fare from the blog! I spend a lot of time in Sydney for work… so I’m sure I will hit up some of these places sometime next year. I love sydney and the food places in sydney – I used to study in sydney. cant wait for more reviews to appear on your blog. By any chance, did you go to the chat thai and the fish market? I think that there’re too many GOOD food places in sydney. wow. wow wow wow. this makes me wish that i had spent my entire holiday in sydney instead of jetting around aussie & nz. glad you had fun! don’t worry about the weight, you’re skinny (well, the last time i saw you, you were)! haha. Was great to meet up with you again. You are right about the cafes, everyone wants to open up one. Plus the cafe culture here in Sydney is big, we all love a good coffee and quick hearty meal while just chatting with good friends or reading the paper in the Sun! Ah, glad to see you made it home safe and sound. It was an absolute pleasure meeting you and hope you had a good taste of Sydney! Can’t wait to read more and see more photos! Mike: KL is easy enough, i will love to go manila too, heard a lot of good things. For now, i hope to go Vietnam next year! Shayna: Too bad i din have the chance to go Mel, next time! Howard: I think that theory applies not just in Sydney, but any parts of the world, here in Singapore there’s so many ppl who dreams of opening a cafe too. See u in Singapore soon! Do you feel my tummy growling, do you understand? 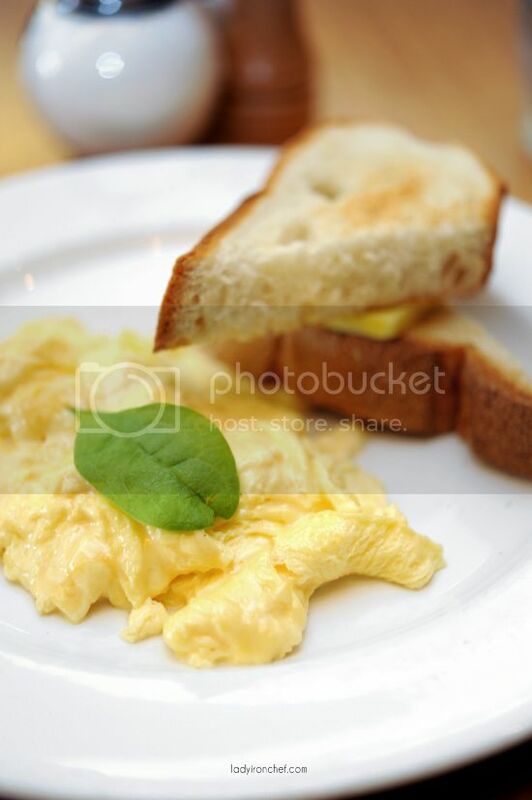 OMG look at the gorgeous scrambled eggs! And the coffee art is really pretty. wow.. u must have enjoyed yourself thoroughly! if only i could do what you do, and get paid. that’d be heaven. btw, thanks, you have re-ignited my love for eggs can’t wait for the other posts to be ready!! …i love scrambled eggs! you make me wanna go sydney, seriously. haha. Come here my sweetheart, here, hold my hands. Shall we feast? Yes we will, yes we will. We eat, and eat, and eat. emily: oh no, i don’t get paid, at least not enough to cover my meals. Beautiful shots – Charming cafes are evergreen, all over the world. One can eat light, a full meal, or even watch the world goes by sipping on a cup of coffee. 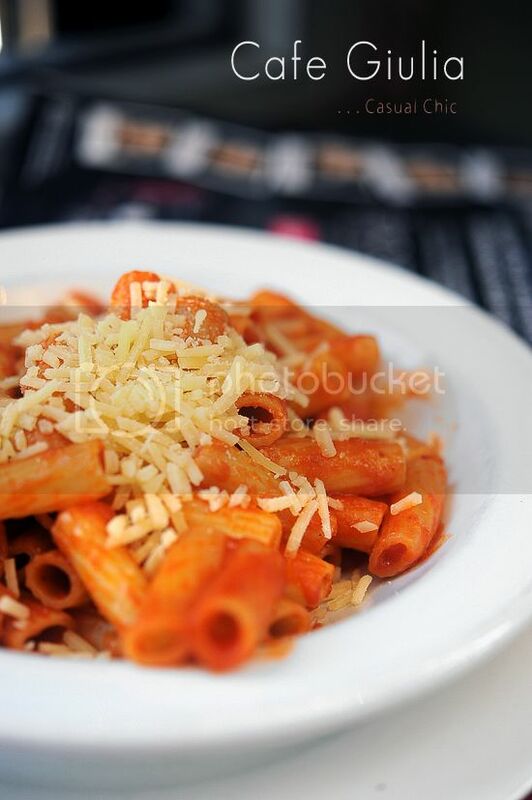 gorgeous food pics! ah, another good reason to head to Sydney other than Bondi beach. did u go? so you brought your 60mm along for the ride? was the weight manageable? haha..
Sarah: thanks! nope i din go to Bondi beach cos i went to the one at Central coast, not really a beach person so yeah. 60mm is pretty heavy, but how can you not bring it along? Amazing photography as always Yeah, Bill’s is a place I’ve yet to try but many birdies have told me the scrumptious meals that they serve. Having grown up in Australia, I love my breakfast too so I’m saddened to hear that when I make my trip to Singapore next year there won’t be any! 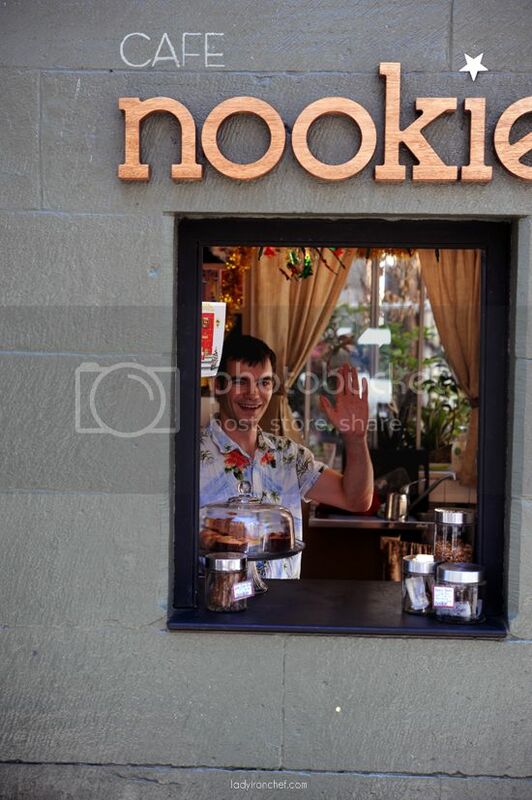 Like Simon said, it’s amazing what you learn from international visitors – I haven’t heard of this Nookie Cafe so I must go have a look! I await your other Sydney posts! i simply adore cafe ish and bills! their eggs are heavenly and fluffy, melt-in-your-mouth kind! love to come here during the weekend! AY: you haven go to bills? how can? no no, Singapore has brunch too, but most places serve it on weekends, only a few have it during weekdays. Prive, riders, epicurious are some of my fav place for breakfast. oh wow, you did cover quite a lot of restaurants and cafes than I expected! Glad you had a great time here. billy: I told you, I ate and ate and ate all day. lol! I went back for the soft shell crab eggs benedict the week after. so yummy. Might go again this week! Hit us up again next time you’re in Sydney! Was lovely to meet you at the picnic – and hope you enjoyed the sights and tastes of Sydney!